‘Seems like a very long time since I’ve been in here to see what’s going on…lots of challenges travel inevitably bring on in between my last post and now…more on some of those later. Hubby and I returned from our tour of Scotland, Ireland and England a week ago. It’s taken about that long to recover from jet-lag and get back into a semi-routine, but last night I managed to stay awake until 10 p.m. (instead of 7:30 or 8:00 p.m.) and only had to get up once. Which leads me to consider now some of the things–well, one thing at least–you should NEVER do when you’re in the grips of jet leg. Don’t be in such a hurry to download those digital pictures that you do it in your semi-sleep. That’s pretty much what I did just a couple days after our return. I thought I’d saved them on my desktop to be moved later to a bonafide photo file. 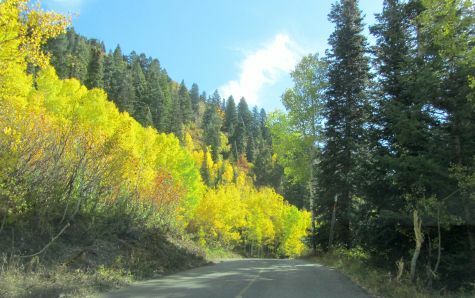 So on Sunday, when Hubby invited me on a drive through the nearby canyon to check out the fall foliage, I felt confident in deleting all the images on the photo memory card in my Canon. Big mistake. Later on in the week when I went back to check out details of the trip through some photos, I found that all I had left on the desktop were the shortcuts to the photos on the memory card. The pictures that had been on the card had all been deleted, and I was the culprit! I’m sorta proud of myself that I didn’t have a “hissy fit “then and there even though I felt devastated enough to bang my head on my desk–IF it would help, but of course it couldn’t. What was done was done! I had to get used to the idea of not being able to remember where I’d seen or purchased such and such, not have the commemorative photograph of my first 1/2 pint of Guinness–a true milestone if ever there were one–and I’d never have a reminder of what that Vegetable Pot Pie looked like at the Edinburgh Pub we ate in that first night. One thing about this stubborn Taurus bull, though! My mind never quit churning. So Tuesday, as I was reminding myself that I couldn’t be the only stoopid person ever to have lost picture files, I turned to Google for help. “How can I retrieve deleted photo files from memory cards?” I typed. There were many hard-luck stories–some worse than mine–and I learned a valuable lesson that I’m sharing with you here today. It turns out that in MOST cases it’s easy to restore them. It seems that when you click “delete all” on your camera’s edit menu, the pictures are not actually deleted but are hidden and written over only later–presumably after the card has filled and required overwriting the files in the old space. So as long as no other write or format command is used on that space, or the card’s space hasn’t completely been used up already, the photos should be easy to recover using one of these file recovery tools.To my surprise and thanks to Hubby’s diligence, I found that at least some of them are FREE. He located software he downloaded for free from Zero Assumption Recovery. I should add that ONLY the photo recovery is free, other retrievable files come at a charge. There are many other sources of data recovery besides ZAR available out there–I found one for $39.99 and another for $24.99–but ZAR was free, so why not give it a try since the reviews were good? We connected the memory card into the USB port on the computer, then clicked “download” as per ZAR instructions. Depending on the size of your memory card–mine was 8 gigabytes–and your computer’s speed, the time needed will vary. After less than half an hour, we “recovered” not only the deleted pictures from the recent trip, but all those we’ve taken from the camera since we got it at Christmas, including our India trip in January. We thought the foilage pictures we took on Sunday might have over-written the same number of deleted ones on the card, but because it had never been completely filled (at 8 gigs, that’ll be awhile, thank goodness) everything was still there. You could probably designate only the files you want to recover, but we felt desperate enough to just recover everything–just to be sure–since we’d taken a new batch and saved them to the card on Sunday. Then I spent the time hand-deleting each file I didn’t need. It took a bit of time and patience but I’m happy to report that our memories are now safely saved and stored and ready to be shared. The added bonus for me, of course, is that now I remember many more details of our whirlwind tour, a few of which I hope to share with Wintersong readers soon. A lesson learned through experience is a lesson not soon to be forgotten. You can be sure I’ll be very careful downloading pictures in the future. 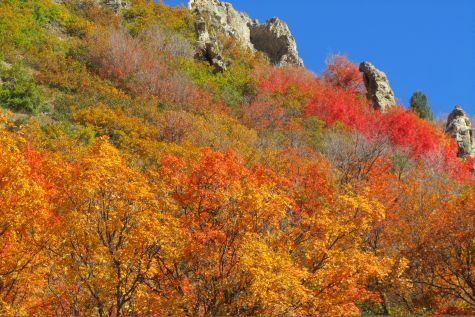 Meantime, I hope you’ve learned something new too, and now enjoy a bit of the local color we’re currently surrounded by through these shots of our beautiful Millcreek Canyon. well that’s a relief! Glad you didn’t lose the pictures, esp. the Guinness one! Delighted to know you are home safely with no ill effects from the Guinness! I look forward to reading about England, Scotland and Ireland through your eyes! Grannymar! I owe you big time!! Not just an email–soon–but for being such a nice lady and paying for the taxi in Dublin! You’re the best! 😀 I don’t even mind if Hubby thinks you’re prettier than me. I missed you. Glad you’re back. Computer files work the same way. The deleted file gets something, like a semi-colon in front of the file name, which tells the computer it’s OK to overwrite. Hate to tell you how many times I had to retrieve files. I didn’t know memory cards worked the same way. Actually the computer probably overwrites on some random basis, rather than waiting for the memory to be filled so it’s best to recover your files quickly. Glad you didn’t forget me, Ruth! I’ve been so rattled lately I thought I’d never function half-way as well as I used to. The exercise regimen at the Wellness Center is showing positive results though so I guess it’s worth it. I usually leave the retrieval of computer files up to the Hubby, but it is gratifying to know there are ways to get around these stoopidity lapses, isn’t it?! Oh thank you. I haven’t done that yet, but I louse up everything else so that will happen here too. I show G your entry, and tell him what’s available. Thanks Mage, I’m glad to be home. And I’ll be even happier when I get around to catch up on what everybody’s up to, especially to see the pictures I know you must have taken on the train journey. I am always worried that I’ll delete before saving! Happy to read that you found a solution and have your photo memories. That always worried me too, but now I feel more confident about deleting stuff. My problem has always been that most of the time I don’t trust myself when I should and vice versa. Btw, that sounds like a roadtrip in the car that you’re on. If I could, I’d like to drive all the way from Florida to Maine on A1A highway about now. It would be beautiful. I totally forgot you were touring GB! What fun. That’s my dream trip, and I hope to see that dream come true in June 2012. Did you plan your own tour or did you go through an agency? Hello Aunty ! Glad to know you managed to retrieve the photos. Ireland and England are so pretty. I travelled throughout Ireland in 1993 and also spent a few days in London. Didn’t take any organised tour then, just did my own stuff. Sometimes I just sit back and go through those old photographs.